Simply put, I like shoes. My husband owns one pair and I own about thirty pair. He reminds me of that fact from time to time. As much as I can't disagree that the bottom of my closet looks like a shoe carnival, I do have my own personal standards on what kind or design of shoe I wear. I won't sacrifice myself for fashion, so I refuse to own any shoes that will cause my feet pain or any that are super uncomfortable. Nope, won't do it. I don't care how cute the shoe is. Recently, I was able to add to my shoe collection with a pair of slip-on shoes from Bzees. Bzees is the simple and stylish footwear choice to add a spring in your step through your day’s highs and lows. Easy-to-wear and easy-to-wash, they’re your ideal companion for everyday reality. Truth be told, I like almost all the shoes that Bzees has to offer. The designs and colors are fashionable and all the shoes look like something I could comfortably wear. 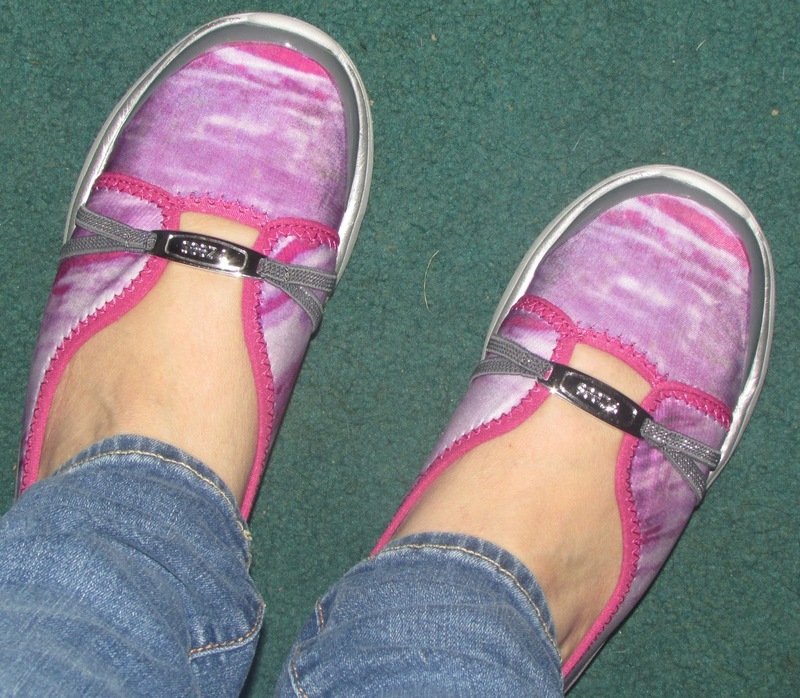 I own the Lavish Slip-On Pink Shoe and have been wearing them often. The Lavish Slip-On sandals are slip-on style with a round toe and have a one-inch heel. The color is a swirl of pink and purple with gray and white outlines. The cushioning insole is gray with white swirl design. It's an upbeat sporty casual look. I've received several compliments on my shoes, with people commenting on the look of them and inquiring where they can get a pair. I'm super happy with them, both for their color design and how I can just slip them on and go. They fit just right and don't hurt my feet after walking for a long time in them. Bzees offers several style of shoes, from sandals and slip-ons to wedges and athletic footwear. Bzees shoes are made with molded, low density, EVA soles that have micro-cellular air bubbles trapped within that enables them to be lightweight, extremely soft and bouncy resulting in excellent flexibility and cushioning. Every Bzees shoe is designed with a dynamic fitting stretch upper material over/across the top of your foot that enables your foot to move freely and naturally but have the necessary support. In addition, a viscoelastic memory foam arch support provides a compressive customized fit to accommodate a wide range of arch heights. They are also made with wash-friendly materials. I have yet to test out how well my shoes do in the wash, but I'm super happy with how they feel on my feet. One person will win a pair of Bzees shoes in choice of style and size. I do like the Women's Signature Slip-On in the Blue Design or the Black Design. I liek the Delight slip on. I like the Green color. I love the Women's Duet Sandal. Great summer shoes! I like Lavish Slip on in blue. I like the delight slip on in green! I love the blue lavish slip ons. Those are the cutest most comfy looking shoes I've seen in a long time! I love the dash sneaker in black. I love the Dream sandal in grey. They are so cute and look s comfortable. They have some nice looking shoes! I love the Sashay Slip on or the Desire sandal the best, I think. Women's Flawless Slip On, white. Thanks. Honestly, I like all of their styles, but I think my favorite is the Women's Freedom Slip On, especially in the pretty Mood Indigo color. I like the Women's Flawless Slip On in Multi. Wow - what a great variety of comfy shoes! I would love to try the Women's Dream Sandal in orange - how cute would they be? id love the womens delight slip on in navy! they would make a great yard shoe for gardening!! I would love a pair of the dream sandals. I so liked the Women's Freedom Slip On shoes! I like the Delight Slip On. I like the multicolor women's flawless slip on. Thanks! Oh, I love these so much! My grandma has a pair of shoes that are similar! These would definitely be a cool gift for her. I really like the Signature Slip on in Blue. They're so cute! I really like the women's Desire sandal in black and lime as shown above. I really like the Women's Duet Sandal. I love the Women's Flawless Slip On. I like the dream sandal and the flawless slip on. I like the Delight Slip-On in Navy! I like the Dream Sandal. I'd get the Desire Sandal in black. I really like their Women’s Dash Sneakers; look very comfortable. I like the Women's Signature Slip-On in Blue, thanks! I like the Women's Desire Sandal. I love the Women's Dash Sneaker but they are all so cool! I like the Flawless Slip Ons in white/gray. Oh so hard to choose! I really love the Women's Signature Slip-On Black!!! They all look so comfortable! I like the Delight Slip On in Black. They look super comfortable. I love the Women's Flawless Slip On in grey/black print! Thanks for the chance! The Women's Splendid Flat Maroon looks very nice!